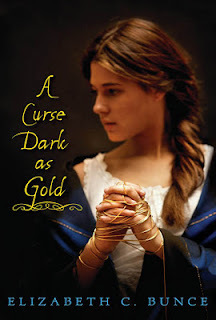 A CURSE AS DARK AS GOLD was the perfect historical fantasy. Although historical fantasy is a genre I enjoy, it's not one I read much of, and this one incorporated so many elements that I enjoyed. The story begins just after the death of Charlotte's father, leaving Charlotte and her sister Rosie to take over responsibility for the family mill, called Stirwaters. Although they do their best, whispers of a curse on Stirwaters begin to circulate as, through bad luck, everything seems to be coming apart. It started out a little slow, but as I found out later, the slow beginning was just what the story needed in order to build up the tension of the later parts. Charlotte's world is based very firmly in a historical setting, and the magic is introduced so slowly that it doesn't seem to intrude upon the real world. Bunce takes the beginning to set up the world and really let the reader meet the characters and understand them before introducing the fantastical elements. The setting for A Curse Dark as gold is highly historical, taking place on the cusp of the industrial revolution, and the characters fit right into the world. Bunce writes her characters wonderfully. I felt as if I knew everyone in Shearing (the town), and even the villain was a shade of gray (albeit a darker shade). The characters stay with you, almost as if they glide out of the book and follow you noiselessly around. Charlotte, as the main character, was most developed of all. I could almost hear her voice in my head, and she passed Small Review's WWMCD (What Would Main Character Do) test nearly every time. Although Charlotte's stubbornness was a little frustrating to read of at times, I grew to love her character - and everyone around her. I even found sympathy for a few characters I was not expecting to care about in the least. But with Charlotte especially, I felt like I knew her so well that I could easily be her friend outside of the book. And Randall was wonderful. He's the kind of character one might dismiss, but is really holding the story together. Without Randall, Charlotte would have fallen apart, as she herself admits. He is so unassuming and obviously loves Charlotte so much. It was a pleasant surprise to see how fond I'd grown of him. The plot of A Curse Dark as Gold was surprisingly complex. I was expecting a straightforward retelling in a historical setting, and I got so much more than that. The story stands on its own far beyond the tale it's based on. All of the subplots that, although intriguing, seem unconnected come together to create a complex and tightly woven story (pun not intended) that all fits together in unexpected ways. Surprising and wonderful. The historical element adds an extra layer of richness, and the characters are strong and real. I'd happily read this again, and I've added it to my list of wonderful fairy tale retellings.